It’s difficult to keep track of disarmament fora. So readers could be forgiven for overlooking the fact that the UN’s Open-ended Working Group (OEWG) on Taking Forward Multilateral Nuclear Disarmament Negotiations will hold its third meeting in Geneva in mid-August. 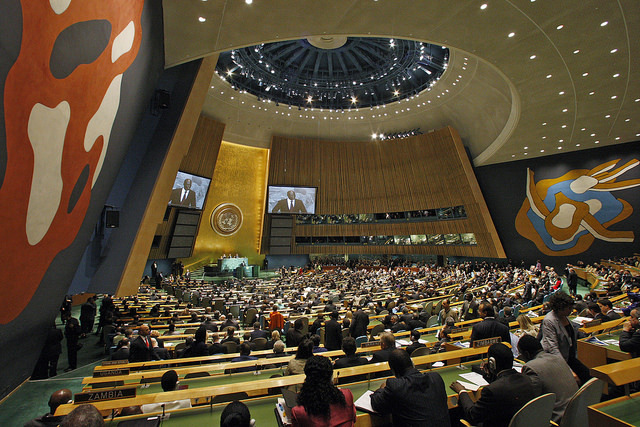 The group—which has already met during February and May—is a subsidiary body of the UN General Assembly. Its task  is to finalise a set of recommendations which ‘substantively address concrete effective legal measures, legal provisions and norms that will need to be concluded to attain and maintain a world without nuclear weapons’. Moreover, the OEWG is also meant to come up with a series of recommendations to facilitate multilateral nuclear disarmament negotiations, including transparency measures, enhancements to nuclear weapon safety and security, and measures to raise awareness of the humanitarian consequences that would result from any nuclear detonation. That’s no small task. Frankly, nuclear disarmament looks harder now than it did 20 years ago. Much of the first task—some describe it as ‘filling the legal gap’ in the NPT—has turned upon the question of whether the time’s ripe for a treaty banning nuclear weapons. That would be a huge step, made more challenging by the fact that none of the nine current nuclear weapon states seems at all engaged in the UN process. Previously, even when nuclear weapon states have been willing participants, nuclear arms reductions have proved to be fantastically complex exercises. And those negotiations have essentially been bilateral, not multilateral. It’s hard to believe that much progress can be made towards actual nuclear disarmament simply by delegitimising the weapons. Putting it bluntly, we don’t accept the premise underpinning the OEWG’s activity—that what’s essentially a strategic problem can be solved by passing a law against it. Swirling through the OEWG’s thinking about legal measures—supposedly made ‘concrete’ and ‘effective’ by the enforcement power of the UN Security Council, the permanent five of which are nuclear weapon states—is a strong theme that nuclear weapons are inhuman. Efforts to ban nuclear weapons are founded on the proposition that the humanitarian consequences of their use are intolerable. The campaign is centred on the Humanitarian Pledge  movement which Austria initiated in 2014 and pushes for efforts to ‘stigmatise, prohibit and eliminate nuclear weapons’. An UNGA resolution  says that they have unacceptable humanitarian consequences because of their ‘immense and uncontrollable destructive capability and indiscriminate nature’. UNGA voted  on the Humanitarian Pledge in July 2015, adopting the resolution  with 139 ‘yes’ votes and 29 ‘no’s’, with 17 countries abstaining. Australia voted no, as did Canada, Germany, South Korea and all the P5—except China which abstained, as did Japan and North Korea. Let’s face it, there’s never going to be a majority voting against it. But that doesn’t make Australia’s position wrong. None of the pledgers are nuclear weapon states, nor the beneficiaries of an extended nuclear assurance, so the pledge is merely the strategic equivalent of teetotallers swearing off alcohol. By what standards do we judge that nuclear weapons are ‘inhuman’? Obviously, the test is rather more than simply one of whether they kill, maim and injure people. All weapons do that. Rather the tests are the classical ones from just war theory. Do the weapons allow for a sense of proportionality? Do they allow for a sense of discrimination between military and civilian targets? Does any sort of use impose unacceptable costs on the broader international community? The problem is that the answers to those questions depend on how nuclear weapons are used. Most use is, of course, gravitational, not direct: that is, the weapons generate their most helpful effects merely by existing. In direct use, consequences would vary. Obviously, a large warhead dropped on a city would have far greater humanitarian consequences than, say, a tactical nuclear weapon used against a naval target at sea. The first case would be the equivalent of a modern-day Hiroshima; the second an instance of nuclear use in a limited war scenario. True, even the use of a low-yield warhead in an overtly military context would still be ominous—and not least because such use would be freighted with escalation dangers. Still, the actual use might kill no more than a conventional weapon used in the same setting. Conversely, the fire-bombing of cities in World War 2—Tokyo and Dresden, for example—showed that large numbers of civilians could be killed using conventional weapons. To quote Robert Jervis, the nuclear revolution  ‘magnifies in force and compresses in time imperatives that already were present’ in pre-nuclear days. But that magnification and compression ensures nuclear weapons are special and terrible—which is why the mere threat of their use is so effective at inducing caution among decision-makers. Yes, in the long run we should be looking to a world beyond nuclear weapons. But that will take time and effort, not just a vote at the UN. Ashleigh Sharp is a research intern at ASPI. Rod Lyon is a senior fellow at ASPI.